I was actually getting to the point of annoyance when someone would say, "Hey I have this piece of furniture I don't want. You want it for free?" Just kidding. I wasn't really annoyed, but instead totally grateful and excited when some friends and acquaintances gave me more pieces to re-do however I wanted (they are coming soon); but I was hoping to have no other project (potential money maker) to come my way so that I could justify my time and attention on the eye sore in my boys' room. Yuck, yuck, yuck I know. I wasn't even quite sure if all of the streaks were stain or wood, or what. 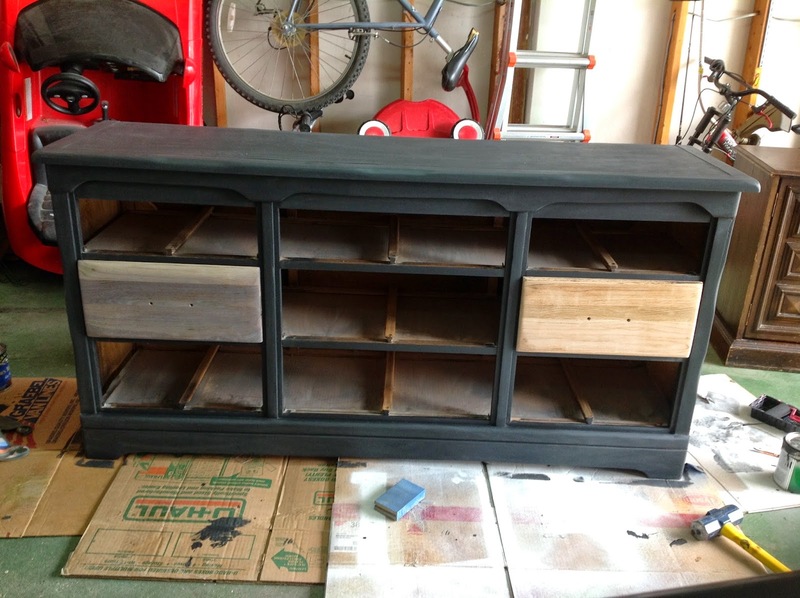 I wanted to sand the dresser and paint the drawers with chalkboard paint since I liked the look of the paint on the drawers I did here, but found that the wood on the sides of the dresser wasn't thick (or real) wood and it wouldn't be able to stand up to the sanding. So I changed up my thoughts and went the opposite route. Because I am impatient I sanded the drawers down using my Craftsman belt sander that had 80 grit sandpaper on it (probably not what a belt sander is meant for). Then I used my Makita palm sander starting with 60 grit for the edges and corners that my belt sander neglected. I then went to 150 grit and then 220 for the drawers to be super soft and smooth. I used 220 grit sandpaper and just hand sanded the dresser (in the direction of the grain) and then wiped it down. The picture is pre-wiping down. 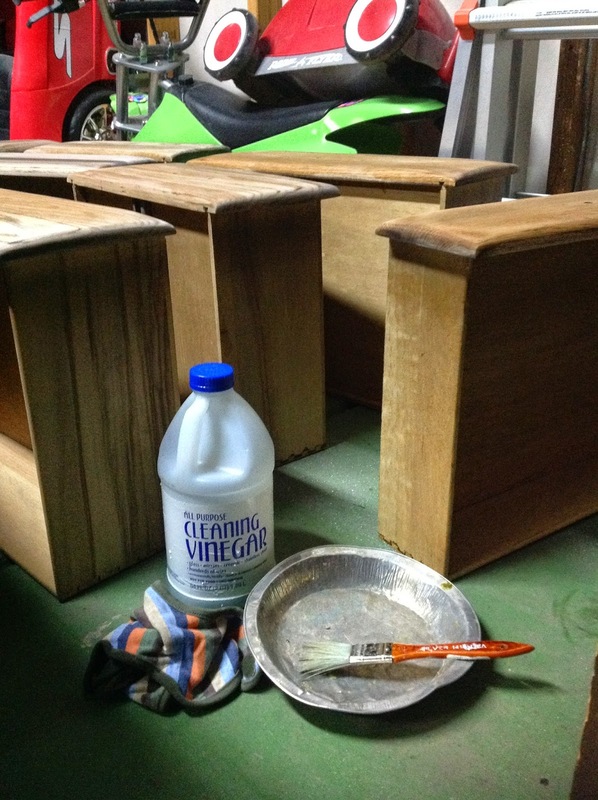 I then wanted slightly weathered looking wood drawers and rather than spend money on stain I went with what I had on hand...plain ol' vinegar and Brillo pads. I wasn't sure how much to use of either so I just shoved 4 pads through the vinegar bottle opening (which had about 2 cups of vinegar left in it). I let the concoction sit for a day and then used a brush and painted on a very thin amount of it on a drawer and then used an old bib to wipe it right off (note: I have a TON leftover. I probably only used 1/8 C of the concoction for all of my drawers) . At first it just looks like you got your wood wet, but give it a few minutes to dry and it turns gray. Craziness! Unfortunately since I was getting raw wood wet I had to then sand it with 220 grit paper again to make it super smooth. If you went the stain route you could skip that extra step. 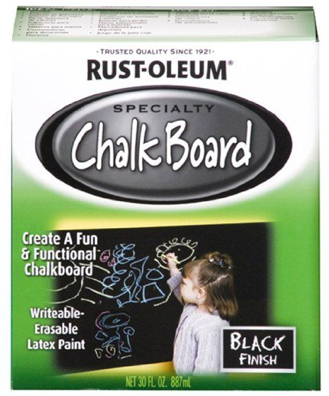 I then used Chalkboard paint that I had on hand from a number of projects ($8-10 a quart? not sure what 30 oz is) and rolled it on the dresser with a mini foam roller. I didn't necessarily want the chalkboard ability on this dresser, but I love how the paint looks. It has somewhat of a blueish gray hue and when I barely sanded it down (after the paint had dried) to smooth out the little bumps in the paint, it made it look more chalky. I felt like it resembled Restoration Hardware's look a little and made it seem industrial almost. I put a grayed drawer in and a non-grayed drawer in to see what look I liked better. I also had to get Facebook feedback too and love how my friends and peeps pull through with their opinions. The opinions were somewhat mixed. I decided I wanted the drawers somewhat weathered but not too gray since the dresser was a bluish gray and I wanted more of a separation of the two. I then made a very watered down brown paint mixture and wiped it on and rubbed it off to bring more brown out. (Again I had to use the 220 sandpaper to bring the softness back. Annoying.) Once the drawers were dry I used my General Finishes clear top coat in the satin finish to protect the drawers. To make the dresser match the look of the drawers a little bit more, I used my palm sander with 100 grit sandpaper and sanded down the edges. 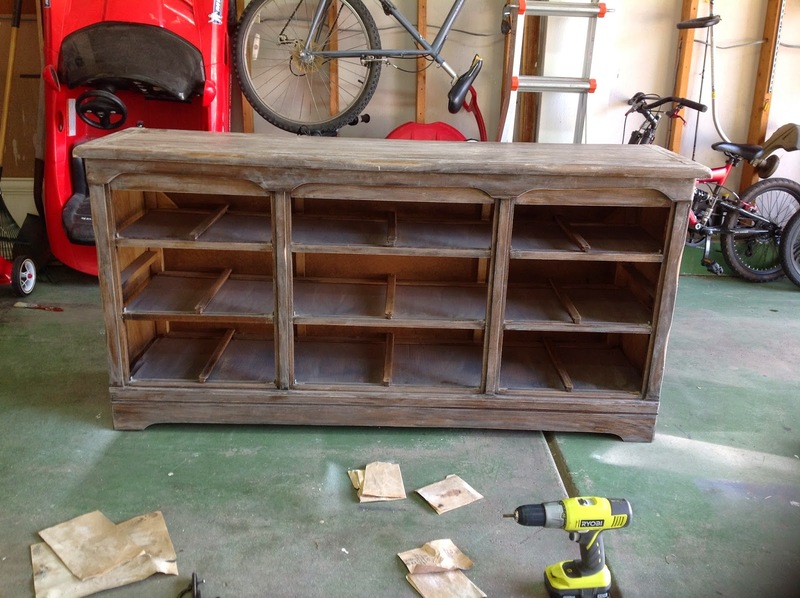 Lastly I used the last of my oil rubbed bronze spray paint for the hardware and put the pulls back on the drawers. Voila! All done! I just love how it has an industrial/rustic feel. Perfect for a boys room I think. Now I just need to decorate the room to match! And btw, the dresser looks so much better in person. I personally hate my point and shoot camera and am in the process of shopping for a DSLR camera. Hopefully Craigslist won't let me down because it seems to always pull through when I need it most :). Little risky when buying electronics so we shall see! And just one more friendly reminder of how far this dresser came. Hopefully y'all have nicer furniture in your home and none of this poo colored business, but if you do don't get rid of it, just get creative! 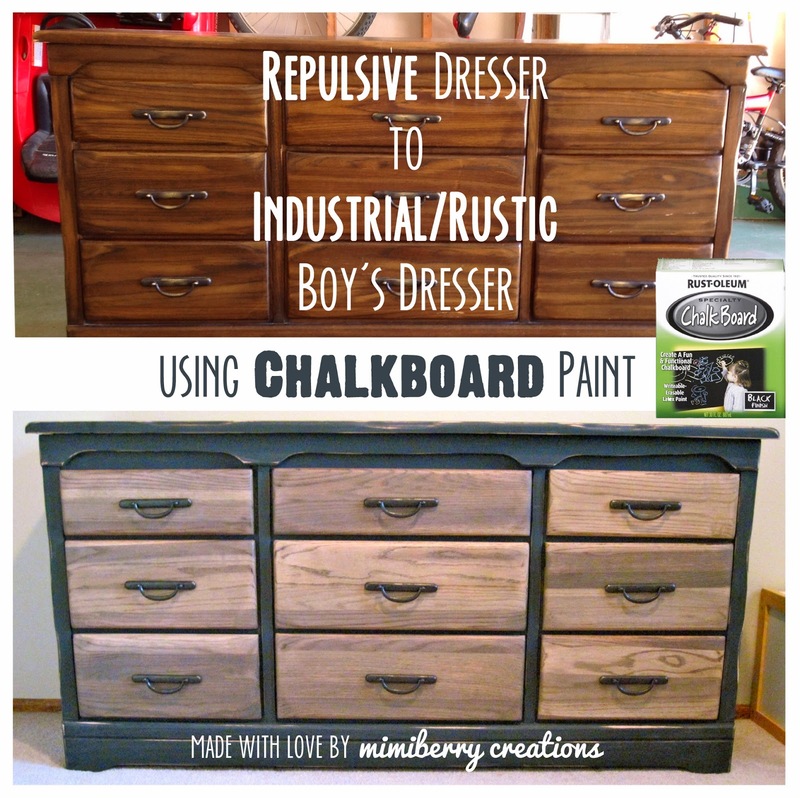 What have you used chalkboard paint for? Isn't it awesome stuff? So versatile and it goes a long way. Please share cause I love hearing from you! I love this so much!!! Getting the wood that color seems so complicated though. Should I just sand the fronts down totally and apply a weathered looking glaze? This is amazing. 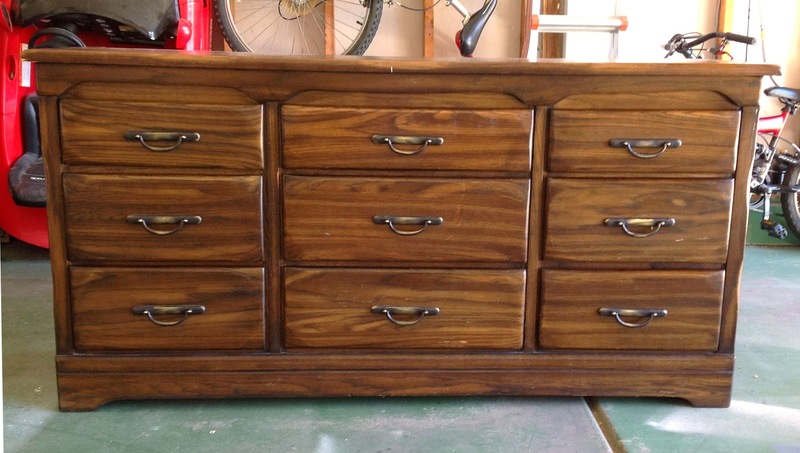 Jamie, I'd totally sand the drawers to raw wood and just do a weathered gray stain. I've never seen the weathered glazes but they could work too! Even just a coat of polyurethane would look good too, I think. I wanted to try a new technique and so I did, but I feel like there are easier ways to get the same look. Thanks so much for asking! Comments make my day so please say hello and let me know what you think! I’m Mimi Crisenberry, a stay at home mom of four boys, who creates to keep herself happy and sane. My goal is to empower others to create too & to always be brave enough to try new things. Each project I do utilizes the gifts trees have given us, whether it is wood or paper. 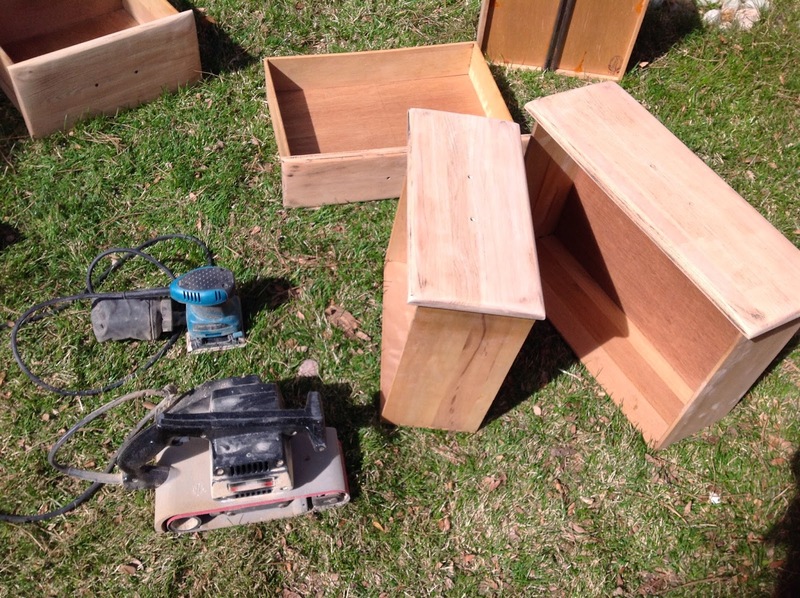 Ever since I was exposed to the fun world of power tools, I have loved restoring and transforming furniture, as well as our 1970’s ranch home, and will share with you the many tips & tricks I learn along the way. While I love working with wood, I also love the blank canvas of paper, and love drawing. I'm excited that our creative journeys have brought our paths together. Here's to trying new things & improving what we have, all on a budget! Want creativity sent right to your inbox? 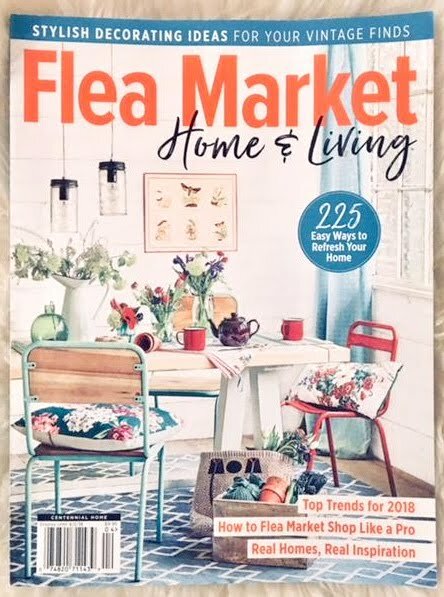 Sign up for the latest tips, tricks, and ideas--crafted just for you.